For four decades, the RTC has demonstrated a commitment to building and maintaining a transportation infrastructure that provides the public with a wide range of travel mode choices in Santa Cruz County. From investments in bike lanes and bike parking, to support for transit and paratransit projects, from funding for park and ride lots to purchasing the rail line, multi-modal projects are a key component of the transportation system that the RTC has envisioned and helped manifest in Santa Cruz County. Simply having good multi-modal facilities and options is not enough. People need to know what choices are available and how to access them. Through its online Cruz511 Traveler Information service, RTC helps people navigate and use the transportation system. A real-time traffic map, complete with speeds, camera images and incident information can help travelers make better choices about their time, route and mode of travel. 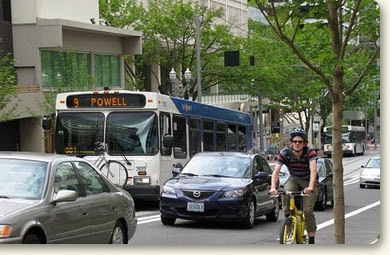 Transportation consultants provide personalized trip planning and support to help people find the best bus or bike route, a carpool partner, or a bike or walking buddy. Cruz511 In Your Neighborhood applies the Cruz511 Traveler Information program to a neighborhood scale by providing neighborhood-specific bus, bike, walk or carpool resources to individuals who express interest. The Cruz511 In Your Neighborhood pilot program selected households in two neighborhoods, Central Watsonville and Eastside Santa Cruz, to participate in the program. Participants in the Cruz511 In Your Neighborhood Program had the option to order neighborhood-specific resources and were provided with a comprehensive set of customized travel resources to encourage them to ride the bus, bicycle, walk and carpool based on their interest. The Cruz511 In Your Neighborhood–Final Report & Appendices (large file size 18MB) provides information about the program background, development, implementation, results and lessons learned. Climate change, an interest in health and wellness, and fluctuating gas prices have generated new interest and support for ensuring that people have lots of ways to access the things they want and need and that they have good reliable information about their choices. True to its legacy, the RTC continues to invest in innovative multi-modal projects such as Cruz511, launched in May 2015.